As your blog grows, you will have many old posts lying under the pages, and if you aren’t using them, you’re missing out on a great opportunity to scale up your blog’s future. Every article on your blog contains some great information and users may not be able to come across those items. Any of your readers will hardly spend the time to go through pages and check the old articles. Additionally, the old articles won’t have the same writing style or formatting as you follow today. For these reasons, recycling old blog posts or instead repurposing articles is a great way to help your new readers find those precious gems. Not only you’d get more traffic, more social share, but a boost in SERP rankings as well. Why Recycle Old Blog Posts? You must have come across a situation when you no longer find topics to cover or are too lazy to even start writing. Worst case scenario, your blog will stay dead for months without any new article and eventually you’ll face drop in traffics and rankings. I’ve faced the same situation like a hundred times, and my best move to handle it is to recycle old blog posts. Going to the last page of the blog and reading articles in there, does make you look like a noob, and you’ll instantly think about changing or updating it. Additionally, you’ll also get some ideas about new topics to cover and discuss next, just by going through the external links and discussion section. So, it works like a kind of content curating strategy as well. But Shafi, how do you recycle old blog posts? What are the different ways? This is why this post exists, isn’t it? Through my personal experience and tips from other blog friends, I have compiled a list of 10 ways you can recycle old blog posts for better good. The different ways shared here will help you get more traffic, social shared, and hopefully a ranking boost. Interlink old articles from your blog when you are writing new posts. It is also a good practice for SEO and gives web crawlers a chance to recrawl the article. When you’re creating a new post, look for words which are relevant to your previous articles. For example, if you are writing a new article about “Men’s Fashion” and you come across words like “Basics of Fashion” and “Fashion Ideas,” then you can link them to your previous articles. One thing to note here is that the anchor texts should be relevant to the article you’re linking. Try to avoid click here or this page anchor texts as much as possible. Use secondary or long tail keywords for this purpose as it will help you have a balanced anchor profile. Also, don’t flood your post with interlinks, maintain a proper balance of 3-5%. One of the typical characteristics of a smart blogger is that they utilize their contents as much as possible. And creating series posts or roundups are best ways to achieve it. You can create a new series of articles, by using these old articles which show something in step by step. The best example of this is to build a step by step guide to starting a blog where you list out all your articles regarding domain name, web hosting, SEO, promotion, etc. Another benefit of creating a series is that you get to know that if you have missed any critical topic in-between, if yes, go ahead and create a new post on that. Don’t just keep sending your original articles to your subscribers. Share your old blog posts from time to time so that those who have joined your article later will get more to read. If you’re making a blogging mistake by not collecting email subscribers, stop and rethink your strategy. It is essential for long-term growth. Don’t underestimate the power of social media. You don’t only have to share your latest posts here but recycle old posts to capture new users attention. Free plugins like Revive Old Post will automatically tweet your old contents on Twitter regularly. There’s a Pro version available which will do the same task of re-posting on other social media sites like Facebook, Tumbler, etc. However, do note that you shouldn’t tweet the same thing over and over again. Your account will most likely get suspended over duplicate tweet issue. You can also use these social media automation tools to automate your social media marketing without the need of hiring a VA.
ShareSlide is the most popular slide sharing platform, and there are millions of users using it monthly. Creating slides don’t take much of your time, and you need not be perfect at it. You can make simple slides with useful but brief points and upload it on ShareSlide. Apart from a backlink, you will get extra traffic on your site. One good practice to follow is to avoid using hard to read fonts and use a professional template only. As discussed in my article about Best Google Fonts, a simple font will improve reading time by a good number. Similar to the above points, you can create simple videos of your old posts. Simple videos, like tutorials, whiteboard or animated slides will do the job for you. You can even add them to your new as well as old articles to increase visitors reading time. There are some talented gigs on Fiverr and Freelancer who can do the job for you. Similar to creating a series, you can write an ebook on any course and use your articles in it. Ebooks are getting popular day by day, and every popular blog on the Internet is selling ebooks. While you may not sell it, you can give away it for free in exchange for subscribing to your newsletter. Opt-in freebies are the best ways to get more subscribers. A simple ebook with 10 tips or chapters can boost your subscriber count. A For Any Questions page can be helpful for new bloggers and answers most of the fundamental questions about the niche. Make a list of 10-15 most asked questions and solve them by using your old posts. You can keep updating the page and adding questions as your site grows. Do not forget to add FAQ page in the primary menu of your blog and let visitors know it exists. Generally, I try to create an FAQ section at the end of the post which briefly answers some questions I have received from my readers and on forums. If you scroll down my blog, you will find a beautiful block of recommended articles at the end of this one. This simple widget or section will give your visitors more great articles to read and keep them on your blog for a longer time. You can use Yet Another Related Posts Plugin to add this function if your WordPress theme does not support this functionality. If you are a blogger who loves to keep track of your monthly achievements and goals then posting monthly reports is an excellent way to do it. It builds user trust, and many will visit your blog especially to check out your monthly reports. Many pro bloggers share their monthly earnings and include popular articles in it. Since monthly reports are the most popular posts on a blog, they get the maximum limelight, and people often do read popular articles. These were some of the ways you can use to recycle old blog posts and gain new visitors without much work. 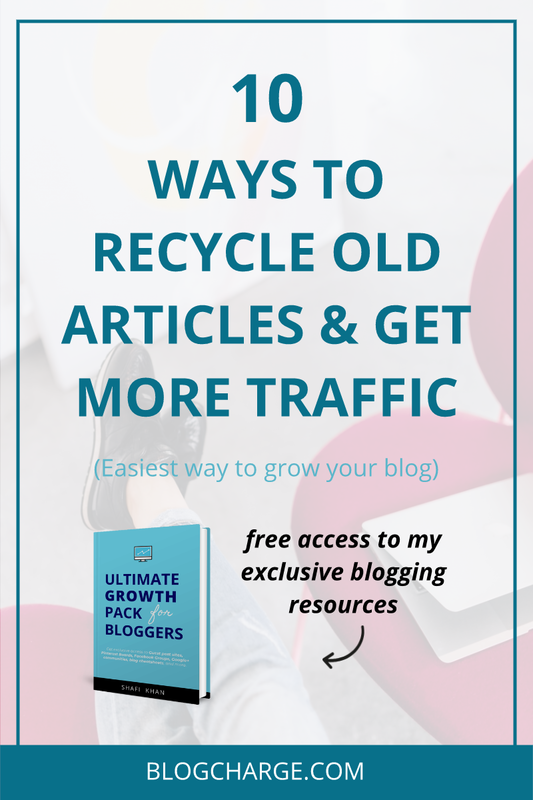 If you are not recycling your old blog posts, then you are missing out a large part of your traffic. Act fast and start doing it ASAP. Already recycling your posts? If yes, then what are the ways you are using to recycle old blog posts? Share your ideas and views about recycling old blog posts in the comments section below. 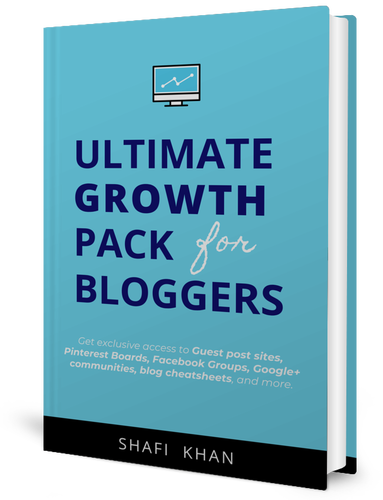 Don’t forget to get your free access to Bloggers Growth Pack by entering your email address below. As always, do shower your love by sharing this article with your blogger friends. The feeling of demotivation is the barrier you need to break. It’s a great idea to update your older posts. Two years ago, I was like you. I used to update my older posts because of the lack of motivation and the time to write. Actually, that’ a great idea when you want to keep the content refreshed. Thanks for stopping by and sharing your personal experience. Keep visiting. Nice post, I’ve been trying to recycle my old posts and looks like these tips are indeed of great help. Nice Post Bro.This is going to helpful for me Can you Please tell me How to Rank a Keyword?? Take care of on page SEO while you’re writing your article and write only quality articles. Once published, focus on getting good quality backlinks to the post, and your post will start ranking for a keyword based on the competition. Great information and thank you so much for sharing with us. Great to see you found this article helpful. It is always better to keep your site updated with fresh content but when you can’t think of new articles then recycling old posts is definitely a winning strategy. Let me know how it goes and if it helped you increase your blog traffic. Writing a new post with a brand new idea is not possible every time. This post would help me in recycling the old post into new one. Glad you liked it. Keep visiting. I got a lot of old posts, no visits no comments… Filling up space like a haunted empty house… But you just saved me… Your tips on recycling the old blogs are incredible….. Thanks for the comment Ugyen.